In the past two decades, many studies have warned of the role the popular media might play in the stigmatisation of the poor. Media reports about poverty often include references to antisocial behaviour, which make the principle of deservingness particularly conspicuous and could also strengthen the effects of ethnic stereotypes. We argue, however, that it could be misleading to place all the blame for stigmatisation on direct references to 'undeserving' behaviour. Media images of extreme distress themselves could have a selective stigmatising effect. Thus, even benevolent portrayal of the poor could erode sympathy. This paper presents the results of a video-vignette experiment on a sample of Hungarian students. The subjects watched one of four versions of a video interview with a poor person (none of them contained any references to antisocial behaviour) and then expressed their attitudes towards welfare payments. We found that support for welfare was higher where a version highlighted signs of extreme distress. But this was only the case if there were no mention of ethnic minorities. If the video report emphasized that Roma (Gypsies), the largest disadvantaged minority group in Hungary, lived in the neighbourhood, signs of their extreme hardship lowered the support for welfare payments. 1.1 In an era of recurring waves of welfare state retrenchment, the public image of poverty has become a crucial issue in social policy research. Many studies have already warned of the role the popular media might play in the stigmatisation of the poor. Research in the US tends to focus on racial bias in media reporting on poverty (e.g. Gilens 1999, Clawson and Trice 2000, Kellstedt 2003). Some European scholars, on the other hand, point to the potential effects of the institutional context on the way the media predominantly portray the poor. In fact, in liberal welfare regimes, the issue of 'deservingness' has been placed under the spotlight and some 'problematic' groups of the poor have attracted particular media attention. Albrekt Larsen and Dejgaard (2013) suggest that the United Kingdom is a prime example of such liberal regimes where the popular media often tend to disapprove of the poor. 1.2 In spite of these differences, most scholars agree that media reports about the most desperate neighbourhoods often include references to antisocial behaviour. Such references could well strengthen the effects of ethnic stereotyping and make the principle of deservingness particularly conspicuous in the formation of attitudes towards welfare payments. Unfortunately, there is still no sign of a tendency to turn away from essentialist images of the poor in the popular media of some modern welfare states. Without doubt, there is a clear lesson for media professionals to learn here. 1.3 However, in this paper, we argue that it could be misleading to place all the blame for stigmatisation on direct references to 'undeserving' behaviour in the media portrayal of the poor. We suggest, instead, that the media images of extreme distress themselves could have a selective stigmatising effect. That is to say, even benevolent portrayal of the poor could lay the ground for an erosion of sympathy. 1.4 This paper presents the results of an experiment which aimed to explore the effects of cues of poverty and ethnicity in media reports on people's attitudes towards welfare payments. We conducted a video-vignette experiment on a sample of Hungarian students using a 2X2 between-subject factorial design. The subjects watched one of four versions of a video interview with a poor person and then expressed their attitudes towards welfare payments. The four versions differed from each other with respect to including ethnicity and signs of extreme hardship versus images of moderate poverty. None of them contained any direct references to antisocial behaviour. 1.5 We found that support for welfare payments was higher where a version highlighted signs of extreme distress in a poor person's neighbourhood. But this was only the case if there were no mention of ethnic minorities. If the video report emphasized that Roma (Gypsies), the largest disadvantaged minority group in Hungary, lived in the neighbourhood, signs of their extreme hardship prompted lower support for welfare payments than images of moderate poverty did. 2.1 The stigmatisation of the poor has a long history (e.g. Geremek 1997). It is a widely held opinion among students of social policy and the popular media that the media portrayal of the poor has further fostered negative attitudes towards poverty assistance in some post-industrial democracies in recent decades. Researchers have identified several attributes of media reporting which could have contributed to a negative image of the poor. 2.2 First, deep poverty is often presented hand-in-hand with antisocial behaviour. Collective unrest and other violent events, for instance, are among the most important factors which attract editors' attentions to the most desperate neighbourhoods (Gilens 1999; Tyler 2013). Moreover, as Albrekt Larsen and Dejgaard (2013) show in their analysis of British, Swedish and Danish popular media, in systems dominated by means-tested benefits, journalists can easily find sensational examples of 'welfare-fraud.' It should also be noted that not only images of violent and law-breaking behaviour indicate undeservingness, but hints, even subtle ones, of a lack of willpower and effort could be equally as detrimental as the images of violence (Hammer 2008). 2.3 Second, in some countries, stereotyped minorities are over-represented in media reporting on poverty. Gilens (1999) suggests, for instance, that this over-representation could lead to some ethnic stereotypes extending to all welfare recipients. He is talking about the US, but Afro-Americans are not the only disadvantaged minority group in the developed world which is stereotyped as lazy and violent. 2.5 However, social policy research and media analysis also point to an additional factor. Namely, the tendency to narrow the focus of poverty reports on to the most desperate neighbourhoods. As Albrekt Larsen (2007) argues, the significant social gap between the poor and the middle classes decreases public empathy with the poor. Labelling the poorest with the negatively-charged term 'underclass' may well increase this social distance even further (Tyler 2013, c.f. Fraser and Gordon 1994, Wacquant 2004). 2.6 Nevertheless, existing media research suggests that the major problem of excessive focus on the most distressed is the tendency to present deep poverty coupled with images of antisocial behaviour (Gilens 1999; Albrekt Larsen and Dejgaard 2013). On the other hand, psychological theory suggests that perceived social status in itself could send signals about personality traits (e.g. Fiske et al. 2002, Cuddy et al. 2008). This influential model of the crucial dimensions of social perception predicts that individuals' low status demonstrates low competence to the outside observer. Based on this model, one might argue that concentrating on the most distressed among us makes it easier to blame the poor for their failure to adapt to the challenges of the post-industrial era. But it should be noted that, according to survey evidence across the developed world, the public image of the poor and support for poverty assistance mostly depend on recipients' supposed efforts to escape poverty rather than merely on their skills (e.g. Lepianka et al. 2010). 2.7 However, as we argue in more detail elsewhere, status also could send noisy signals about effort (Janky and Varga 2013). In this respect, there is a difference between the poor and the poorer. The duration of unemployment in itself, for instance, could be perceived as an indirect indication of lack of effort for finding a job. Also, as the duration of unemployment lengthens, the household runs out of resources to secure decent housing conditions, appropriate clothing and healthy food. In addition, one should not ignore the mental effects of diminishing expected returns on job search activities. All these changes weaken the signals poor people can send out about their efforts to the outside world. Media reports on the poor, besides sending many other messages, inevitably communicate these signals, when presenting information on hardship and distress. The poorer a selected neighbourhood is, the weaker the signs of 'deservingness' are presented in media reports on living conditions there. 2.8 But images of extreme hardship, we assume, do not inevitably erode sympathy (c.f. Bauman 1998). Rather, images of deep poverty in media reports raise viewers' uncertainty about deservingness. Images of extreme hardship in themselves do not necessarily provide strong evidence for antisocial behaviour. But they do not provide evidence for deserving behaviour either (Janky and Varga 2013). As psychological research predicts, this ambiguity calls for the intensive use of group-specific stereotypes in forming judgments on responsibility (Bodenhausen and Lichtenstein 1987, Krueger and Rothbart 1988). If a media report lacks references to antisocial behaviour and stigmatised groups, images of distress may actually increase empathy. At the same time, we suggest, viewers react to group cues more intensively when the images of hardship are extreme as opposed to moderate. H1. Ethnic cues in media portrayals of poverty have a significant effect on attitudes towards welfare payments. H2. Media articles which highlight extreme hardship among the poor but avoid references to antisocial behaviour could foster public support for poverty assistance. H3. The effect of hints about ethnicity on attitudes towards welfare also increases as a consequence of media images showing extreme hardship versus moderate poverty. H4. Hence, media images of extreme hardship among the minority poor could negatively impact public support for poverty assistance - even if the media content makes no mention of antisocial behaviour. 3.1 We conducted a video-vignette experiment (c.f. Iyengar 1990) among university and senior high school students to test our hypotheses (629 respondents filled in the self-administering questionnaires). We showed four versions of a ca. seven minute video report to groups of students, one version to each group. Subjects then filled in a short questionnaire shortly afterwards. The report featured a poor person talking about how he and his family met their material needs. Hints on the degree of poverty and ethnic composition in his neighbourhood were manipulated so as to create the four different versions. 3.2 Our report is on a 38-year-old male, unskilled, occasional construction worker, father of two, who was aware of the scope and method of the video-vignette. We interviewed him at his home. The edited version lasted ca. 4 minutes and the discussion covered the most crucial aspects of his material welfare: his earning prospects, the consumer goods the family could afford and his longer term objectives. There was only one version of this edited interview. However, we created four versions of the introduction which briefly presented the neighbourhood in which he was supposed to be living in, in different ways. * Links to the videos can be found in Notes 3-6. 3.3 Table 1 shows the distinguishing characteristics of the four versions of the introduction. The baseline version contained no reference to the ethnic composition of the neighbourhood and presented - verbally and visually - a mixed picture of the living standards and perspectives of the local residents. The 'deep poverty' version, on the other hand, included images of extreme hardship, sombre music and a narration emphasizing distress. Images of dark-skinned people and information on the presence of Roma in the neighbourhood were added to the baseline intro and the 'deep poverty' version to create ethnic versions of the report. The 2X2 between-subject factorial design was completed in this way. We tested the importance of both of the ethnic and status cues. The survey evidence suggests that we used appropriate tools for indicating status and ethnicity. 3.4 The students filled in a short self-administering questionnaire after watching the video. The questionnaire included a dependent variable and some controls. The dependent variable was based on an item about the appropriate level of welfare payments in Hungary. It provided information on the current rules on welfare payments and asked whether such payments to similar persons should be increased, decreased or maintained. 3.5 The experimental sessions were organised in classroom settings in selected Hungarian universities and high schools. Altogether, 629 respondents filled in the self-administering questionnaires in the Spring and Fall semesters of 2011. One could argue that students could be particularly sensitive to experimental manipulations. Still, there is much to say in defense of the external validity of experiments based on student samples (e.g. Druckman and Kam 2011). Nevertheless, theoretical arguments cannot subtitute for an appropriate test of the particular hypotheses on a general population sample; and such a robust test is still to be done. 3.6 We analysed the data using simple T-tests and ordered probit models. The use of multivariate models was necessary due to the imperfectness of the randomisation process in our convenience sample and the excessive external media noise around one of the Spring sessions. 4.1 The subjects who watched the baseline version of the report were fairly positive about welfare payments in Hungary. Overall, 42% of respondents suggested increasing the amount of cash benefits for the poor, while only 15% wanted to reduce them. 4.2 However, when ethnicity of the neighbourhood was added to the baseline version, the audience expressed less positive attitudes towards cash benefits: only 33% supported any increase in payments in this treatment group (the difference is significant at the 10% level). However, external media noise could have distorted the results. Indeed, according to those multivariate models which control for such distortion, there is no significant difference between the attitudes expressed in the 'baseline version'- and the 'ethnic frame' groups (Table 2). That is to say, the evidence does not clearly support our first hypothesis on the general influence of ethnicity in media reporting on welfare attitudes. 4.3 On the other hand, Hypothesis 2 is supported by the data: the regression estimates showed that images of extreme hardship created significantly more positive attitudes towards poverty assistance than the baseline portrayal of the poor. (Note that we avoided any reference to antisocial behaviour in our report.) Our findings indicate that the benevolent portrayal of deep poverty could increase sympathy with the poorest of people. 4.4 However, we argued that prior stereotypes could play a particularly strong role in judging those living in the most desperate neighbourhoods, without any hope of stable jobs. The data support our assumption (H3): there is an interaction between the effects of ethnicity and images of extreme hardship. 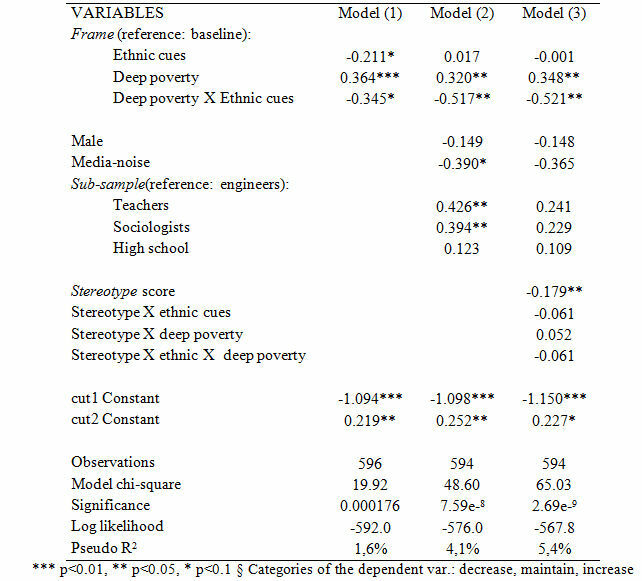 The coefficient of the 'Deep poverty X ethnic cues' variable was significant in the regression estimates (Table 2). 4.5 Hypothesis 4 states that the above-mentioned interaction could be so strong that a strengthened influence of negative stereotypes would completely suppress the positive impact of the benevolent portrayal of deep poverty. Indeed, our vignette-design produced a large enough interaction effect to suppress the empathy induced by images of extreme distress. What is more, our findings suggest that the images of extreme hardship reduced sympathy for the minority poor (Figure 1).Nonetheless this evidence is not straightforward (the coefficients are marginally significant and not robust to all of the reasonable changes in the model-specifications). To sum up, our report on poverty could increase sympathy by emphasising extreme hardship and avoiding references to antisocial behaviour. However, when the Roma come into the picture, viewers react unsympathetically to the images of extreme distress. 4.6 One should note that in contrast to previous research, our models could not detect any moderating role of ethnic/racial predispositions (what one can see only is that those who hold strong negative stereotypes about the Roma, are less supportive of the welfare transfers; see Table 2, Model (3)). This may highlight some shortcomings of the measurement instruments we used. But the conclusions based on the main effects of the frames are not weakened by such supposed shortcomings. Rather, these inferences can be considered as conservative estimates of the cognitive mechanisms we tested. 4.7 We also controlled for respondents' perceptions of the frames we created. These findings should be very carefully interpreted. We conclude, however, that conscious interpretations of the vignettes could play a role, but peripheral route processing was also likely to be at work in the formation of attitudes (e.g. Igartua and Cheng 2009). 5.1 Media editors addressing the issue of poverty could have several reasons for focusing their attention on the most desperate neighbourhoods..First, institutions surely frame their thinking. In certain welfare regimes, but not in others, policy debates revolve around assistance to the poorest (Albrekt Larsen 2008). Second, the popular media know they can attract more attention by focusing on extreme examples than by presenting average cases (c.f. Graber 1990). Third, media professionals may even fulfil a social mission when searching out the most distressed and vulnerable ones in order to raise emotions and foster public empathy for the poor. 5.2 Our video-vignette experiment was designed to explore the potential effects of such attraction to images of extreme hardship. We showed that the excessive focus on the distress of the poorest of the poor does not always foster solidarity. 5.3 Our research was motivated by the Hungarian experience and the particular results may depend on the specific societal context. Namely, in Hungary, which is a middle-income post-communist country, a large share of the population has experienced or witnessed closely the hardships of poverty in recent decades. Thus, the public image of poverty could be more multifaceted here than in some more affluent welfare states where there may exist an unconditional stigma on deep poverty. This may have contributed to the positive reactions to the images of 'white hardship' in the Hungarian sample (see H2). Still, we suggest that the main message could apply to several other modern welfare states: Even benevolent portrayal of the poor could lay the ground for an erosion of sympathy (H4). 5.4 We investigated how images of extreme distress interact with ethnic cues. But ethnicity might not be the only label which could stigmatise the poor. The term 'underclass', for example, has become a negatively-charged concept in the English-speaking world. One could speculate that this term might as easily mobilise negative stereotypes as ethnic/racial cues do (c.f. Bauman 1998, Tyler 2013). Future research might shed light on this question and could also expand the scope of our analysis. Support provided by the research project K108836 of the Hungarian Scientific Research Fund and the 'MTA Bolyai' Scholarship is gratefully acknowledged. We are indebted to Christian Albrekt Larsen, Judit Gárdos, Ágnes Horváth, Dorota Lepianka, Vera Messing and the participants of the session on 'The social construction of poverty' at the Espanet Conference in Poznan, in 6 September 2013, and those of the 'Jour fixe' seminar at the Institute for Sociology of the Hungarian Academy of Sciences in 3 October 2013 for their comments on an earlier version of the paper. We also owe six bottles of table wines to Jeremy Lovitt-Danks for his thorough proofreading. 1A formal model of the argument can be found in Janky and Varga (2013), Horváth and Janky (2014). 2The transcript of the interview is available in the Online Supplement. The video-interview itself (subtitled) is available upon request from the corresponding author. 7According to the latest reliable estimates, Hungarians belonging to the Roma minority amount to about 6% of the population (Kemény and Janky 2006). A direct comparison of their situation to the ones of Gypsy and traveller communities in (North-)Western Europe could be misleading. In many respect, the problems most of them face resemble those which pose burden on African-Americans and some immigrant groups in Western Europe (Ladányi and Szelényi 2006, Szalai and Schiff 2014). Blue collar industrial jobs provided moderate but decent living conditions for the majority of the Roma families since the late 1960s until the mid-1980s. Postindustrial transformation gave way to the emergence of a high rate of long-term unemployment in this population (Kertesi and Kézdi 2011a). Increasing level of segregation and multiple forms of discrimination have helped to maintain exclusion from the labor market (Kemény and Janky 2006). The public education system is unable improve the perspectives of incoming generations of the Roma youth (Kertesi and Kézdi 2011b, Szalai and Schiff 2014). Popular stereotypes depict the Roma as basically lazy and unreliable with an inherent tendency to break the law (e.g. Enyedi et al. 2005). Nevertheless, some differences are worth mentioning. First, interethnic boundaries are less salient than the black-white divide in North-America; while fairly stringent intra-ethnic boundaries exist within the Roma population (Kemény and Janky 2006). The ways of social construction of Roma ethnicity in Hungary are somewhat closer to the patterns observed in South-America than to those ones documented in the US (Ladányi and Szelényi 2001). Skin color and facial structure are less often as indicative as in the case of African-Americans. Moreover, the faith-based, linguistic and cultural divides which marginalize many of the new immigrants to Western-Europe are not relevant issues in the case of the Hungarian Roma today. We exploit these features in our video vignette by presenting the same individual in the two ethnic frames Lastly, unlike in most of the developed world, the poorest, segregated communities are still concentrated in rural areas. Overt industrialization had only moderately changed the basically rural character of the Hungarian Roma population (Kemény and Janky 2006). 8See Tables S1-3 in the Online Supplement. 9See the Online Supplement. For the analysis, we reduced the six-grade scale of the dependent variable to a three grade one (decrease, maintain, increase). 10A simple power analysis (based on OLS estimates) suggested that a sample size of at least 550 respondents would be required to test our hypothesis with a power of 80% (with an alpha-error of 10%). The first wave of the sessions was conducted in the spring semester of 2011 at the Budapest University of Technology & Economics. Respondents were engineering students of an elective course who were randomly divided into separate classes. 380 students responded in the four sessions carried out that spring. In December 2011, a new series of sessions were conducted in Budapest and the South-west Hungarian town of Pécs (with ca. 150,000 inhabitants). The fall sample included senior students (17 to 19 years old) of premier high schools in Pécs, undergraduate and graduate students of the University of Pécs Sociology Programme, and, finally, undergraduate students at a teachers' college in Budapest. This second wave provided 249 questionnaires. Only four of the 629 respondents identified themselves as Roma. We excluded them from the analysis. The 2X2 between-subject factorial design was completed within each of the institutions. 11See the analysis of external media noise in the Online Supplement. In the multivariate models, a dummy variable indicates the presence of excessive external media noise. The media analysis suggests that the session held in 29 April could have been disturbed by external noise. 12See Table S6 in the Online Supplement. 14Based on dichotomous probit estimation of Model (3), and carried out with the Stata command "margins." Marginal effects are calculated at the means of the covariates (c.f. Bartus 2005). 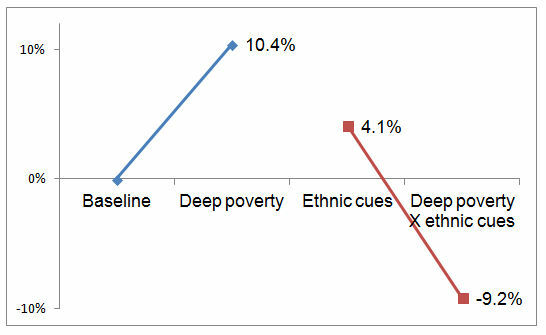 The opinion difference between the 'baseline'- and 'deep poverty' treatments is significant at the 10% level. The opinion difference between the 'ethnic'- and the deep poverty X ethnic treatment is only marginally significant in the full sample but significant at the 10% level in the sub-sample comprising the two ethnicised treatments. 15See Table S7 in the Online Supplement. BARTUS, T. (2005) 'Estimation of marginal effects using margeff', Stata Journal, Vol. 5, No. 3, p.309-329. BAUMAN, Z. (1998) Work, consumerism and the new poor. Buckingham and Philadelphia: Open University Press. CUDDY, A. J., Fiske, S. T., & Glick, P. (2008) 'Warmth and competence as universal dimensions of social perception: The stereotype content model and the BIAS map', Advances in experimental social psychology, Vol. 40, p.61-149. [doi://dx.doi.org/10.1016/S0065-2601(07)00002-0]. DRUCKMAN, J. N. and Kam, C. D. (2011) 'Students as Experimental Participants: A Defense of the 'Narrow Data Base', in Druckman, J. N., Green, D. P., Kuklinski, J. H. and Lupia, A. (Eds.) Handbook of experimental political science. New York: Cambridge University Press. [doi://dx.doi.org/10.1017/CBO9780511921452.004]. ENYEDI, Z., Fábián Z. and Sik, E. (2005) 'Is Prejudice Growing in Hungary?' In. Kolosi, T. Tóth, T.I. and Vukovich, G. (eds): Social Report 2004. Budapest: TÁRKI, p. 363-385. FISKE, S. T., Cuddy, A. J., Glick, P., and Xu, J. (2002) 'A model of (often mixed) stereotype content: Competence and warmth respectively follow from perceived status and competition', Journal of Personality and Social Psychology, Vol. 82, No. 6, p.878-902. [doi://dx.doi.org/10.1037/0022-3514.82.6.878]. FRASER, N. and Gordon, L. (1994) 'A genealogy of Dependency: Tracing a keyword of the US welfare state', Signs: Journal of Women in Culture and Society, Vol. 19, No. 2, p.309-336. GEREMEK, B. (1997) Poverty: A Social History, Oxford: Blackwell. GRABER, D.A. (1990) 'Seeing Is Remembering: How Visuals Contribute to Learning from Television News', Journal of Communication, Vol. 40, No. 3, p.134-155. [doi://dx.doi.org/10.1111/j.1460-2466.1990.tb02275.x]. HAMMER, F. (2008) 'The Disadvantaged in Infotainment Television: From Representation to Policy' In. Jakubowicz, K. and Sükösd, M. (Eds.) Finding the right place on the map: Central and Eastern European media change in a global perspective. Bristol: Intellect Books. HORVATH, Á. and Janky, B. (2014) 'Ethnic Stereotypes and the Preferences on Poverty Assistance ' Mimeo, BME and MTA, Budapest. IGARTUA, J. and Cheng, L. (2009) 'Moderating effect of goup cue while processing news on immigration. Is the framing effect a heuristic process? ', Journal of Communication, Vol. 59, No. 4, p.726-749. [doi://dx.doi.org/10.1111/j.1460-2466.2009.01454.x]. IGARTUA, J., Moral-Toranzo, F. and Fernández, I. (2011) 'Cognitive, attitudinal, and emotional effects of news frame and group cues, on processing news about immigration', Journal of Media Psychology, Vol. 23, No. 4, p.174-185. IYENGAR, S. (1990) 'Framing Responsibility for Political Issues: The Case of Poverty', Political Behavior, Vol. 12, p. 19-40. [doi://dx.doi.org/10.1007/BF00992330]. KELLSTEDT, P.M. (2003) The Mass Media and the Dynamics of American Racial Attitudes. Cambridge: Cambridge University Press. [doi://dx.doi.org/10.1017/CBO9780511615634]. KEMÉNY, I. and Janky, B. (2006), 'The Roma Population of Hungary 1971-2003' in Kemény, I. ed. Roma of Hungary, , New York, NJ: East European Monographs, CO - Atlantic Research and Publications, p.70-225. KENDALL, D. (2011) Framing Class: Media Representations of Wealth and Poverty in America. Lanham: Rowman and Littlefield. KERTESI, G. and Kézdi, G. (2011a) 'The Roma Employment in Hungary after the Post-Communist Transition' Economics of Transition, Vol. 19 No. 3, p.563-610. KERTESI, G. and Kézdi, G. (2011b) 'The Roma/Non-Roma Test-Score Gap in Hungary' The American Economic Review. Vol. 101, No. 3, p.519-525. KRUEGER, J., and Rothbart, M. (1988) 'Use of categorical and individuating information in making inferences about personality', Journal of Personality and Social Psychology, Vol. 55, No. 2, p.187-195. [doi://dx.doi.org/10.1037/0022-3514.55.2.187]. LADANYI, J. and Szelényi, I. (2001) 'The Social Construction of Roma Ethnicity in Bulgaria, Romania and Hungary during Market Transition', Review of Sociology Vol. 7, No. 2, p.79-89. LADÁNYI, J. and Szelényi, I. (2006) Patterns of Exclusion: Constructing Gipsy Ethnicity and the Making of an Underclass in Transitional Societies New York & Boulder: Columbia University Press. LEPIANKA, D., Gelissen, J. and van Oorschot, W. (2010)'Popular Explanations of Poverty in Europe Effects of Contextual and Individual Characteristics across 28 European Countries', Acta Sociologica, Vol. 53, No. 1, p.53-72. [doi://dx.doi.org/10.1177/0001699309357842]. RAMASUBRAMANIAN, S. (2011) 'The Impact of Stereotypical Versus Counterstereotypical Media Exemplars on Racial Attitudes, Causal Attributions, and Support for Affirmative Action',Communication Research, Vol.38, No. 4, p.497-516. [doi://dx.doi.org/10.1177/0093650210384854]. SZALAI, J. and Claire Schiff (eds.) (2014) Migrant, Roma and Post-Colonial Youth in Education across Europe. Palgrave Macmillan. TYLER, I. (2013) 'The Riots of the Underclass? : Stigmatisation, Mediation and the Government of Poverty and Disadvantage in Neoliberal Britain', Sociological Research Online, Vol. 18, No. 4. [doi://dx.doi.org/10.5153/sro.3157].